Arnau Sala is a rare creature in a town where culture is partly based on hype and fashion. In Barcelona you can constantly feel like something is going to happen in the art and music context but like any other city based on tendencies and fashion magazines things suddenly disappear as fast as they’re created. I don’t know many people in Barcelona who have persisted with an idea for to long, without being influenced by the hype of the moment, besides Arnau. He is the founder, and has been running the independent music label OzonoKids founded since 1999. OzonoKids works as a D.I.Y. 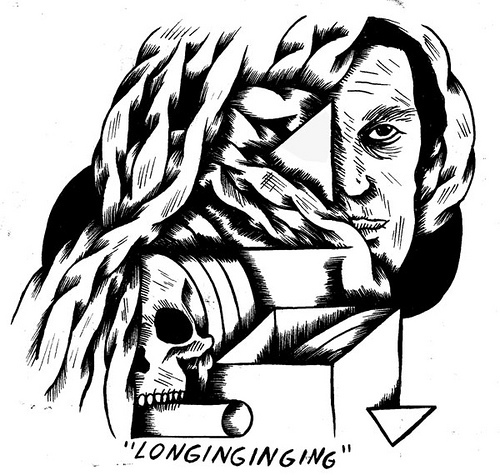 label bringing out weird musical jewels in cassettes or vinyl (sometimes CD as well). National and international artists off of diferent genres such as M Ax Noi Mach, Unchained, Angeldust, Corndawg, Joshua Norton Cabal, Josetxo Grieta, Ensaladilla Rusa amongst others. Arnau also has been a music performer and graphic artist for the last 10 years. 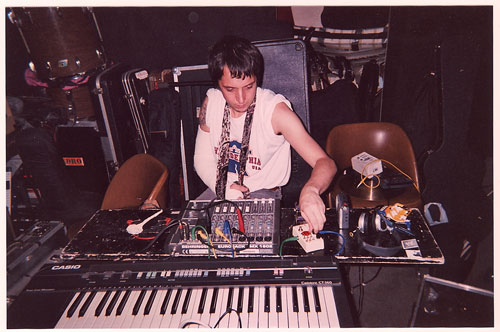 In 2003 he moved to Philadelphia, and got in touch with the local scene, interacted with a collective of local artists related to the current weird American noise scene and developed an interest for electronic music and experimentation with instruments and effects. To talk about Arnau is to speak about one of the most important figures in the new wave of experimental music in Catalunya. Arnau together with Dalmau Boada formed Les Aus, an experimental rock band that has collaborated with people like Lydia Lunch and played festivals such as Sonar, SXSW, LUFF festival in Switzerland, and toured the US and Europe twice. He is also involved in accidental noise and improvisation acts like Homenatges, Bestia Ferida (with Adrián de Alfonso and Mark Cunningham of the legendary NYC No Wave band Mars), even though he also performs solo and collaborates with other artists and performers. Last but not least Arnau is a well know illustrator artist. 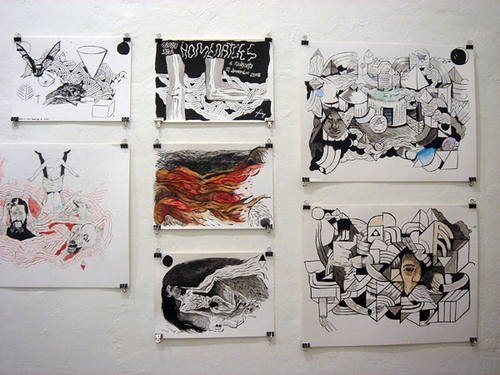 He recently presented his new work at Todojunto Gallery in a solo exhibition. He has also done lots of artwork for musicians and record labels, working mostly on CD and LP covers and posters for gigs. I got to talk with Arnau in his new studio (which is also some sort of secret store) and OzonoKids headquarters in Barcelona. The first time I saw a Les Aus concert was in Sonar 07. Someone told me ” Hey, you got to see this band, it’s the real Barcelona underground”, what do you think about people saying stuff like that? What do I think? I think it’s a nice comment and it’s just great that someone recommends you to come to our show. Only it makes me feel kind of self-conscious that somebody will refer to us as “the real something”. Also, even though we play in Barcelona mostly, we aren’t really a Barcelona band or belong to any kind of scene around Barcelona. We are pretty much a free form any kind of group. Sure we have friends and collaborate with people, but also collaborate with people from all over the world as Les Aus and through our solo projects and art. I think the music you do is a bit weird compared to the standards in Catalunya and Spain, do you think there is audience for your music, and suitable venues? Well, there’s always audience for any kind of music or I’d rather say “sound”. I can’t complain. I think there’s always someone who cares. Sure it would be nice to be able to play more and get more feedback but there’s so many bands and things going on… You hit the spot when you ask me about venues. Even though there is good venues and spaces in Barcelona, it’s usually hard to find one if you want to book a show, specially with experimental rough sounds and loud material. Lots of places were shut down a few years ago, and since the city is pretty much oriented to tourism, it becomes pretty harsh on local artists and independent incentives like ours. We book this festival called Cap Sembrat every year. It’s pretty spontaneous and the schedule is mainly sensitive to last minute changes, for us is very rough when we want to try to find a venue for that, basically because there’s a million festivals and rock shows going on and venues are not used to alien ideas. Sometimes they make you wait a month before they give you and answer and the answer is often a “no”. Then you have to try to find another venue and it takes forever so we’re always crossing fingers. The new Les Aus record is coming on soon.., can you tell me about? I can tell you I feel it as a “seasonal” album, and that’s because we recorded it real fast and It was weird period for both of us. The songs were all structured and build in one day. Rehearsed three times and recorded at Dalmau’s house in the mountains in two days. All the music is very essentially influenced by the time there and it has strong reminiscences on mythology and nature, since Dalmau’s house used to be next to this Catalan castle ruins. That’s why the record is going to be called “Mitologia Natural”. The sound became more rock, sometimes more dark, but also more mellow than we usually do. The improv sessions were limited to two. We’re very happy about it and it’s coming out on the (to us) legendary Californian record label Gravity records. This year is OzonoKids 10th Anniversary. Are you planning to do some celebration? Maybe a new edition of “Cap Sembrat”? Yes, we will have another issue of Cap Sembrat this summer definitely. And I was thinking of doing something about it, maybe a show in August, or some sort of special release. Also, I am planning on maybe destroying OzonoKids in 2010 forever, cause I believe projects need to be born and die in circles of 11 years. I think year 2011 would be a good year to start a new project. Meanwhile OzonoKids is doing better than ever. And the fact that it’s already lasted ten years is pretty shocking to myself and obviously great. You started a project called Homenatges, which is also the name of your recent art show. Homage to who? Homenatges came out off a Bèstia Ferida song in year 2006. Probably nobody remembers that. I liked that name. I thought it was great for this art show I was working on. I think it’s a very essential term. It’s like showing your respects. It could be to anything, to something that makes you feel. It can be anything also. I like terms that are open enough to suggest anything powerful. 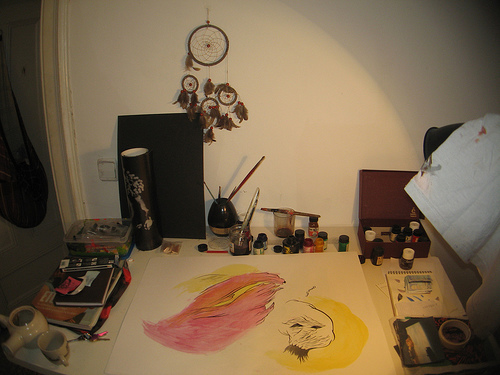 After working on the exhibition I started working on this solo CD called “Homenatges”, it’s not finished yet. But before I finished that CD, my friends Adrián de Alfonso and Rafa Romero and I started this new band and we decided to also call it “Homenatges”. We already played shows with great performers such as Pain Jerk from Japan. Do you see yourself living in another city, another country? I see myself living anywhere. Even though for me it is very tough to adapt. It takes me a long time. I guess I am a slow person. I do millions of things at once but it takes me forever cause I am really sparse. But I am contemplating moving to another European city sometime around 2011 maybe. I have seen the evolution of your illustrations and it seems that the last ones are going a bit more dark and esoteric, is that right? Yes, it is. I pretty much always go where my soul is at the time. My latest works (which you haven’t seen) have lots of light and white energy. But sometimes I crawl into the black hole. I never know. I can get like that sometimes. I come and go. I can’t tell you why really. I don’t choose.